Half a winter’s worth of commuting on the MT-09 Tracer is providing some forensic analysis of the bike’s talents – and almost all of them are providing even greater proof of how good the Yamaha is. 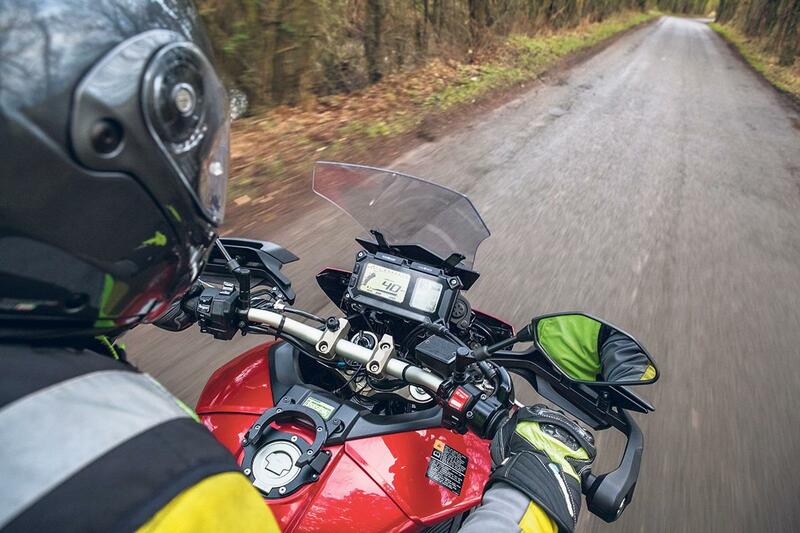 I try to ride all year round, for two reasons: it’s quicker than covering my 30-mile journey to work in a car and it’s three times as much fun on two rather than four wheels. The Tracer is performing brilliantly so far and with the mild (but wet) winter we’ve had so far it’s actually been a lot of fun thanks to the upright riding position. I’d already covered 5500 miles before the colder months arrived and felt I knew the bike pretty well. The darker days have revealed, however, a mass of other talents that add further weight to my argument that the Tracer is a fantastic all-rounder. What’s working to help beat winter blues? My Tracer has benefitted from suspension set-up and modification at the hands of Stowmarket-based suspension gurus MCT Suspension and the more compliant forks that have new springs, heavier oil and a reduced air gap have gone a long way to adding to winter confidence as the front-end pattering has been eradicated. Combined with the suspension changes a set of Michelin Pilot Road 4 tyres (approx £230) slice through the wet to grip nicely and warm up quickly. Yamaha’s official nuclear-hot heated grips (£144.99) are among the best I have ever used and the settings are easily selected through the dashboard. Level 10 is almost too hot to touch for long and the grips work with the protection from standard handguards to keep my hands perfectly warm. The ABS and traction control both operate seamlessly, adding to the confidence oozing from the bike and neither electronic system stops you having fun in better conditions. On dipped beam the full LED front lights cast a penetrating glow a decent way up the road at night, with full beam very bright and excellent at lighting up the unlit back roads I use for most of my commute. The dashboard brightness can be adjusted, which is a boon when riding to and from work in the pitch black. Issues with my Tracer are few and far between since the suspension harshness has been dealt with and the poor original tyres have been changed. When a bike is this good you end up focusing on small niggles and even when added together they do little to take the shine off. I don’t like the way the fuel gauge takes more than 100 miles before it registers anything other than completely full and then instantly drops to half full. The main-beam switch location still isn’t intuitive, even after all these miles, and none of the buttons are illuminated, so finding them at night is a bit hit or miss. I still don’t see the point of the different riding modes on this bike as for 99% of the time I just leave the Tracer in the standard mode. The remaining 1% is when I accidentally change it. The screen could offer better protection in the worst of the weather and on the highest setting it does need frequent cleaning so I can see through it. Oh, and in really wet weather the indicator lenses mist up. After nearly 7500 miles with the Tracer it has really connected with me and I reckon it’s a machine that’s pretty much perfect for most people most of the time. It has enough power and poise to suit any occasion and is pretty comfy too.